Microsoft Forms is a part of Office 365 that allows your users to quickly and easily create custom quizzes, surveys, questionnaires, registrations and more. When you create a quiz or form, you can invite others to respond to it using any web browser, even on mobile devices. As results are submitted, you can use built-in analytics to evaluate responses. Form data, such as quiz results, can be easily exported to Excel for additional analysis or grading. To learn more, see What is Microsoft Forms? Or, see our Office 365 blog post about Microsoft Forms. Note: Microsoft Forms is generally available to Office 365 Education subscribers, Office 365 Commercial subscribers, and users with a Microsoft account (Hotmail, Live, or Outlook.com). Microsoft Forms is on for your organization by default. You can turn it off at any time. When you turn off Microsoft Forms for a user, that person can't use Microsoft Forms. The Forms tile will get hidden in the Office 365 app launcher and homepage. Check out the Assign licenses to users in Office 365 for business topic for steps on disabling or enabling Microsoft Forms for an individual. To set up a conditional access policy for Microsoft Forms, consult Azure AD Conditional Access Documentation and include Microsoft Form in Cloud apps assignments. Note: If users in your organization are still blocked even after you've set up conditional access for Microsoft Forms, ensure SharePoint Online and Exchange Online have also been granted access via conditional access. Learn more. View and make changes to the design (for example, edit questions). View, edit and delete responses. View shared responses or response summaries. The external collaboration setting allows you to restrict the collaboration on the form to only users within your organization. See Share a form to collaborate for more information about sharing a form. Ability for external users to respond to a form (if you specified Anyone with the link can respond for your form settings.). Ability to share a form or quiz as a template with an external user. Click Admin to go to the Office 365 admin center. 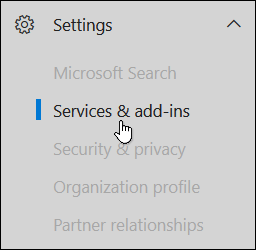 Navigate to Settings > Services & add-ins. 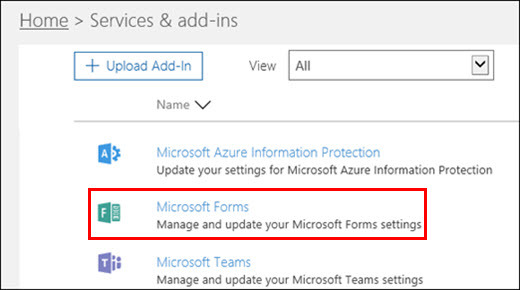 On the Services & add-ins page, click Microsoft Forms. After a setting is turned off, only people in your organization will have access to that option, and only when they sign in. Navigate to Services & add-ins > User Owned Apps and Services. For the option, Let People in your organization go to the Office store, set the toggle to On. Please be aware that it may take a few hours for the change to take effect. Learn more. If your business has legal, regulatory, and technical standards to meet for content security and data use, this section is for you. Where is data stored for Microsoft Forms? Microsoft Forms data is stored on servers in the United States and Europe. All data is located in the United States, except for European-based tenants who started using Microsoft Forms after May 2017. Their data is stored in databases in Europe. Microsoft Forms data follows the O365 Compliance Framework, and meets Compliance Category C as outlined in the framework. Microsoft Forms has also met GDPR compliance requirements as of May 2018. Please refer to Office 365 Data Subject Requests for the GDPR for more information. Are FERPA and BAA protections in place? Microsoft Forms meets FERPA and BAA protection standards. Is there a limit to the number of users and amount of data stored for user accounts even after they have left my organization? Currently, there is no limit for the number of users for which data is retained, as long as the provisioning of their accounts is within your organization's online service agreement. There is also no limit for the amount of data stored for user accounts. The original owner of a form is no longer with my organization and/or their Microsoft Forms license has been removed. What happens to the data that is associated with the form they created? All account-related data will be deleted 30 days after a user account has been deleted from your tenant (Azure AD). What can I use Microsoft Forms for? Microsoft Forms is a simple, lightweight app that lets you easily create surveys, quizzes, and polls. In educational institutions, it can be used to create quizzes, collect feedback from teachers and parents, or plan class and staff activities. In business organizations, it can be used to collect customer feedback, measure employee satisfaction, improve your product or business, or organize company events. Who can use Microsoft Forms? Log in to forms.office.com and start creating surveys, quizzes, and polls. Can people without an Office 365 account still submit a survey or quiz on Microsoft Forms? Microsoft Forms authors can toggle their settings to allow users outside of their organization to respond to their survey or quiz. In this case, users will be submitting responses anonymously. If you want to see who has filled out your survey or quiz, you can require respondents to fill in their names as part of your questionnaire. What is the limit on the number of forms that can be created and the number of responses a form can receive? Office 365 Education and Office 365 Commercial subscribers can create up to 200 forms and each form can receive up to 50,000 responses. Microsoft Forms users with a Microsoft account (Hotmail, Live, or Outlook.com) can create up to 200 forms and each form can receive up to 1,000 responses. If you require more responses, we recommend exporting existing responses to an Excel workbook, and then clearing these from your survey or quiz. This will enable you to collect more responses once cleared. Which web browsers does Microsoft Forms work with? Microsoft Forms is optimized for Internet Explorer 10+, Edge, Chrome (latest version), Firefox (latest version), Chrome on Android (latest version), and Safari on iOS (latest version). In what languages is Microsoft Forms available? See languages supported and language settings for Microsoft Forms. Will Microsoft Forms replace Microsoft InfoPath? No. Microsoft InfoPath was a solution to create customizable forms that can enable automated workflows, whereas Microsoft Forms is a basic, lightweight app for quickly collecting information via surveys and quizzes. Microsoft InfoPath is being replaced by SharePoint Lists, Flow, and PowerApps – modern solutions for digitizing traditional company forms, automating workflows, and transforming business processes. Learn more. Where can I go to submit feedback such as product bugs or feature requests? 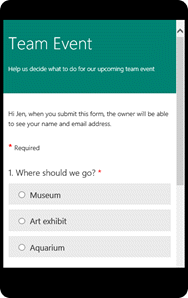 Note: See Frequently asked questions about Microsoft Forms to learn more. See the Microsoft Forms landing page for a complete listing of Microsoft Forms articles.